Socks with sandals are, apparently, a thing. Romeo Hunte – the designer behind Beyonce’s July Fourth weekend dress circa 2015 – debuted his Men’s Spring/Summer 2019 Collection on Wednesday afternoon for Men’s NYFW at Ph-D Lounge in Chelsea, Manhattan. The runway featured primarily models of color and an eclectic collection of looks with an aligning sound. Hunte’s creative concept for this collection drew from his most recent Fall/Winter 2018 collection: looks styled with sports leggings and paired with fur coats and ski goggles. He added even more colors and fabrics this time around while simultaneously still marketing a ‘gender inclusive’ driven line by adding women’s apparel and women models in the casting. The first look consisted of a red and yellow vest, biker shorts, and socks with Chaco style hiking sandals – the hybrid sandal was worn mostly throughout the show. The Spring/Summer 2019 collection exudes the concept of ‘sporty meets street,’ and the throwback ‘90s/early 2000s hip hop and pop music mixed with electronic club beats, gave the show a futuristic vibe. Looks such as scuba suits and biker shorts styled with casual wear, hoodies with purple camo shorts, and bright colored fur-trimmed jackets came circling the venue at Dream Hotel. Interesting looks, indeed, but it worked! 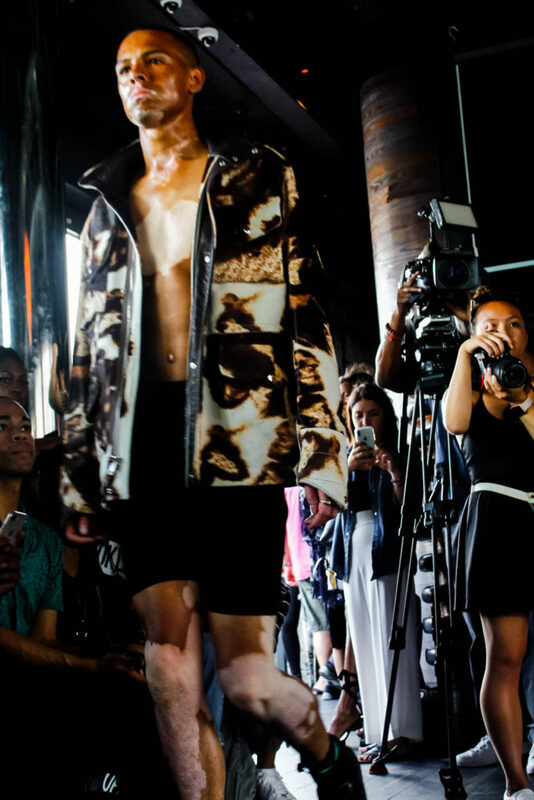 Although some of them were sweating through plastic jackets from the blistering sun, the models still looked cool. The looks in the collection contained combinations of textures and styles that will surely hit the city streets next Spring. These unexpected combos are a showcase to the audience on what to expect for the year to come. 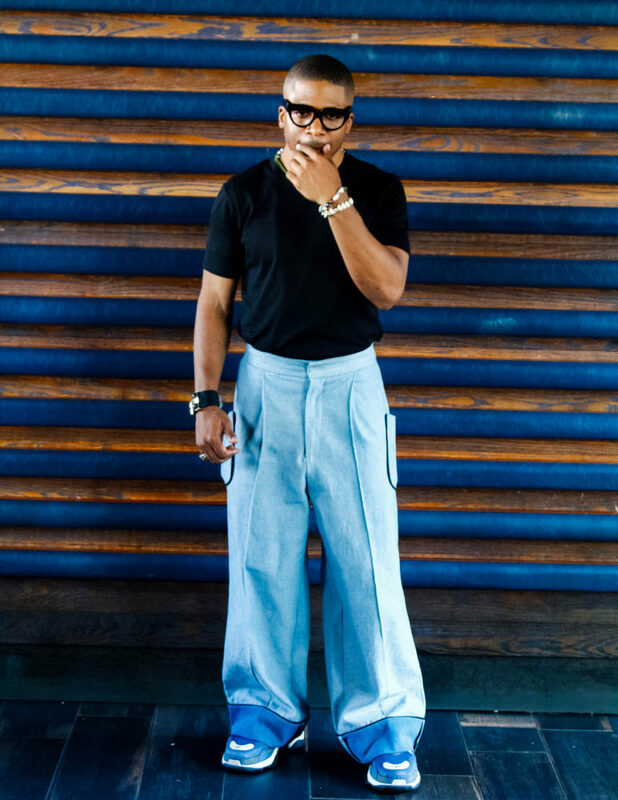 One thing’s for sure – Hunte is not shy about bringing the street style he grew up seeing in Brooklyn to his collections. For his Spring/Summer 2018 collection lookbook, he styled his models in bamboo earrings and Timberland boots staged in familiar sceneries such as the famous Marcy Houses in the Bedford-Stuyvesant neighborhood. This Fashion Week’s men’s collection is another example of Hunte’s approach to street style that is inspired by the city and what the “cool kids” are wearing, or will be wearing next year. And Romeo Hunte is another example of a Black designer staking a claim for urban fashion, Black culture, and Black models in the high end fashion world and fashion tastemakers are paying attention. What an impact Romeo Hunte’s men’s wear debut made on the runway this season. We’ll be sure to keep an eye out for his upcoming women’s collection in September.